Lawmakers have wrestled with the question in the last two sessions of the Legislature, but the decision could be made on statewide ballots. Maine voters may find themselves facing a decision about whether to approve assisted suicide, an issue that has simmered in the last two sessions of the Legislature and could land on statewide ballots next year. A political action group seeking to get an “assisted dying” question on the November 2019 ballot will be fanning out across the state Tuesday to collect signatures at polling places, a crucial step in getting the measure before voters. “It will be a big day for us,” said Valerie Lovelace, chair of the steering committee for Maine Death with Dignity. Lovelace, of Westport Island, said the group already has gathered about 9,000 of the more than 60,000 signatures needed to place the issue before voters. The precise number of signatures they’ll need for the 2019 ballot initiative will be 10 percent of the turnout of gubernatorial voters Tuesday. The group will dispatch more than 130 volunteers to collect petition signatures at 100 polling locations across the state. “We just want to give people the opportunity to vote on this measure,” Lovelace said. The ballot proposal will be modeled after a 1997 Oregon law, which gives people who are terminally ill and determined to have six months or less to live the option of taking medication, with the assistance of a doctor, to end their lives. Since the law went into effect, 1,957 people received a prescription for lethal medication in Oregon and 1,275 have died from ingesting a medication, according to a February 2018 report by the Oregon Health Authority. The laws are sometimes called “assisted suicide,” but Lovelace said that if all the proper procedures are followed, their group does not equate it to suicide, but another option for end-of-life care. “There’s overwhelming support in Maine for this,” said Lovelace, pointing to a 2017 poll by Public Policy Polling that showed 73 percent of Mainers supported legislation that would give terminally ill patients with less than six months to live the ability to legally obtain prescription medication to end their lives. But some religious leaders and medical groups oppose “assisted dying” laws, arguing against it on ethical grounds. 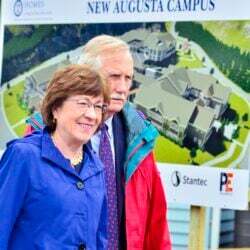 In 2017, when an attempt to pass an assisted dying bill failed in the Legislature, the Maine Medical Association, which represents doctors, was neutral on the issue, while the American Nurses Association and Maine Hospice Council were opposed. The American Civil Liberties Union supported the measure, while religious groups were opposed. “Rather than resorting to this risky proposition of physician-assisted suicide, let’s invest in the medical advances in palliative care and the incredibly effective hospice programs in our state,” Carroll Conley Jr., chairman of the Christian Civic League of Maine, said in testimony to the Health and Human Services Committee in April 2017. The bill, sponsored by Sen. Roger Katz, R-Augusta, passed by one vote in the Senate, but failed in the House. If the latest effort makes it on the ballot and voters approve the referendum, Maine would join Oregon, Washington, Vermont, California, Colorado, Washington, D.C., and Hawaii in having laws permitting the practice. Peg Sandeen, executive director of the Death with Dignity National Center in Oregon, said a contingent from the national center will help the Maine group collect signatures on Election Day.